Fish sense water motion the same way humans sense sound, according to new research out of Case Western Reserve University School of Medicine. Researchers discovered a gene found in humans also helps zebrafish convert water motion into electrical impulses sent to the brain for perception. 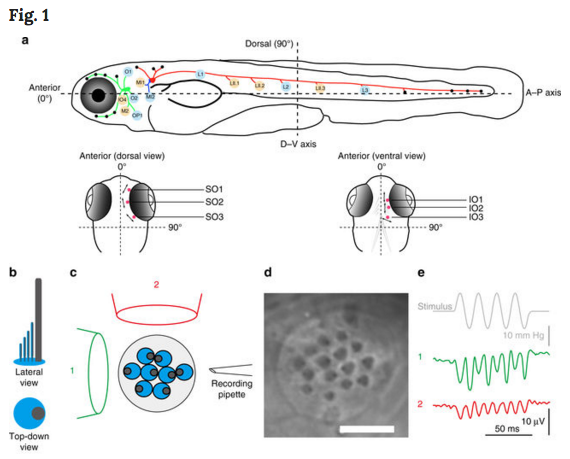 The shared gene allows zebrafish to sense water flow direction, while also helping cells in the human ear sense a range of sounds. The gene encodes a protein in hair cells, the cells that receive sound inside our ear. Mutations in this gene can cause deafness in humans. Not only inside their ears, zebrafish have hair cells along their whole bodies that sense water flow. Hair cells on the surface of zebrafish bodies face in a different direction in order to sense water moving all around them. In the new study hair cells found facing in different directions are not identical as previously thought — each uses the deafness gene slightly differently. "We found detection of water flow from the front of the fish is more dependent on the zebrafish gene tmc2b than water flow from the back of the fish. Water flowing from the front of the fish accompanies forward swimming, and is therefore — routine. But water coming from the rear could mean a predator in pursuit. Zebrafish therefore use different molecular mechanisms to distinguish water flow direction." Brian McDermott Jr PhD, Associate Professor, Otolaryngology, Case Western Reserve University School of Medicine and University Hospitals Cleveland Medical Center, Cleveland, Ohio, USA. McDermott and Ruben Stepanyan, PhD, assistant professor of otolaryngology at Case Western Reserve University School of Medicine published the findings today in Nature Communications. The study dives into mechanotransduction — or how hair cells sense mechanical sound waves, in this case water waves — and converts them into brain signals. McDermott's team discovered hair cells on the zebrafish skin use different mechanotransduction genes — like tmc2b — depending on their orientation. "Not all hair cells are the same. They are different based on the direction they face, and that is key to detecting the direction of water flow," McDermott adds. The study identified the gene tmc2b as central to mechanotransduction. This gene is required for hair cells to transmit signals to the brain, which could explain its role in genetic deafness. McDermott: "Our findings are directly connected to human hearing. We studied a zebrafish gene that is analogous to a human gene that causes deafness, and here we show the defect is in the process of mechanotransduction." The researchers used their findings to create a "mechanosensory map" of zebrafish hair cells. The map shows how a hair cell's location and orientation relates to its ability to sense water motion. It also shows how different hair cells require, or can function independently, of the deafness gene tmc2b. The map could inform future studies related to human hair cell mechanotransduction, and the causes of genetic deafness. Said McDermott, "Zebrafish hair cells are particularly accessible for experimentation, unlike hair cells of the ear of mammals, so they offer a special advantage. You can study the development and functioning of intact hair cells to a higher level in fish than those of the mammalian ear." Differences in hair cells help fish sense water flow patterns — and may also help humans sense different sounds. "In mammals, hair cells are the sensory cells of the ear," McDermott said. "Our findings suggest that in mammals, including humans, there may be molecular differences between hair cells that allow us to hear the wonderful range of sounds that we enjoy." Detection of water motion by the lateral line relies on mechanotransduction complexes at stereocilia tips. This sensory system is comprised of neuromasts, patches of hair cells with stereociliary bundles arranged with morphological mirror symmetry that are mechanically responsive to two opposing directions. Here, we find that transmembrane channel-like 2b (Tmc2b) is differentially required for mechanotransduction in the zebrafish lateral line. Despite similarities in neuromast hair cell morphology, three classes of these cells can be distinguished by their Tmc2b reliance. We map mechanosensitivity along the lateral line using imaging and electrophysiology to determine that a hair cell’s Tmc2b dependence is governed by neuromast topological position and hair bundle orientation. Overall, water flow is detected by molecular machinery that can vary between hair cells of different neuromasts. Moreover, hair cells within the same neuromast can break morphologic symmetry of the sensory organ at the stereocilia tips. Authors: Shih-Wei Chou, Zongwei Chen, Shaoyuan Zhu, Robin W. Davis, Jiaqi Hu, Li Liu, Carol A. Fernando, Kayla Kindig, William C. Brown, Ruben Stepanyan & Brian M. McDermott Jr. This work was funded in part by the National Institute on Deafness and Other Communication Disorders. Grant support included National Institutes of Health grants DC009437 (to B.M.) and DC015016 (to R.S. ); and a grant from the Center for Clinical Research and Technology at University Hospitals Cleveland Medical Center (to B.M.). This research was also supported by NIH Office of Research Infrastructure Program (ORIP) award S10RR017980. The researchers acknowledge use of the Leica SP8 confocal microscope in the Light Microscopy Imaging Facility at Case Western Reserve University made available through the Office of Research Infrastructure (NIH-ORIP) Shared Instrumentation Grant S10OD016164. A Schematic of the zebrafish lateral line. (top layer) Side view of zebrafish. Scored neuromasts are BLUE or TAN and correspond to the graph directly below- with ALL(GREEN), PLL(RED); medial–lateral-line (BLUE) ganglia contact neuromasts. (bottom layer) Dorsal and ventral views of the head show Supraorbital (SO Neuromasts 1 to 3 and Infraorbital (IO) neuromasts 1 to 3 in RED. b–e Evaluation of the axis of best sensitivity for a neuromast. b Schematics of hair bundles. Gray and blue protrusions are a kinocilium and stereocilia, respectively. c Experimental configuration: a top-down view of a neuromast with a fluid jet pipette that provides stimuli (1) parallel to the axis along which the bevel-shaped hair bundles face opposite directions or (2) orthogonal to that axis. The pipettes in the diagram are not to scale. d DIC image of hair bundles of a posterior neuromast from which stimulus-evoked microphonic potentials were recorded. e Recordings from an A–P oriented L3 neuromast with fluid jet pipettes stimulating, serially, from two different directions depicted in c.